Carter Capps - Back to Old Tricks or Just a Spring Thing? Carter Capps pitched only 12 innings for the Padres in 2017, months after Major League Baseball added a rule barring his unorthodox pitching style in which Capps "crow hopped" or reset his pivot foot during delivery. 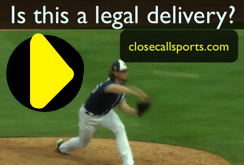 Umpires ruled no violation on Capps' delivery. With San Diego opting to bring Capps in for relief during a Spring Training game, the Carter Capps crow hop is seemingly back, yet 1B Umpire Gerry Davis' crew didn't call any violation when Capps hop-stepped his way through a scoreless ninth on Tuesday against Chicago. Replays indicate Capps' pivot foot, initially in contact with the pitcher's plate, appeared to step a second time toward home plate prior to Capps releasing the ball. Related Post: 2017 Rules Mods, Including IBB Change, Announced (3/2/17). The pitcher may not take a second step toward home plate with either foot or otherwise reset his pivot foot in his delivery of the pitch. If there is a runner, or runners, on base it is a balk under Rule 6.02(a); if the bases are unoccupied it is an illegal pitch under Rule 6.02(b). In 2017, Pacific Coast League Umpire Brett Terry ejected El Paso Chihuahuas Manager Rod Barajas for arguing an illegal pitch call 1B Umpire Terry had made on Capps, while HP Umpire JJ January ejected Capps himself after Capps' subsequent pitch wound up hitting the plate umpire. Yet, Capps was observed seemingly reseting his pivot foot during every delivery on Tuesday afternoon in Peoria. Has baseball suddenly reversed course on the so-called Carter Capps rule, are the rules more lax during Spring Training, or is Capps' move actually legal? Appendix: "An ILLEGAL PITCH is (1) a pitch delivered to the batter when the pitcher does not have his pivot foot in contact with the pitcher’s plate."